Air Lift air spring systems include all necessary hardware to inflate air springs manually using an external compressor and select a static ride height. Air Lift also makes on board air compressor systems to automatically change your vehicle's ride height any time, any place, from the comfort of the driver's seat. No more finding a gas station every time you need to tow heavy trailers or carry heavy loads. Just use an on board air compressor to fill your Air Lift air springs easily and quickly. Air Lift WirelessAIR Remote Controller. The WirelessAIR controller and compressor system is simple to use, powerful and functional. Simply put, it is the best air controller system you can buy. Control ride height from inside or outside the vehicle with the wireless controller. Air Lift's WirelessAIR compressor and controller allow you to adjust your vehicles ride height by inflating both air bags at the same time or individually. This controller automatically maintains a set pressure to the airbags, even while driving. The WirelessAIR system can remember two preset ride heights and automatically adjust to bag pressure to maintain the desired ride height. This controller works with ALL Airlift airbag support kit systems and uses a heavy duty air compressor for years of trouble free service. Air Lift WirelessONE Remote Controller. 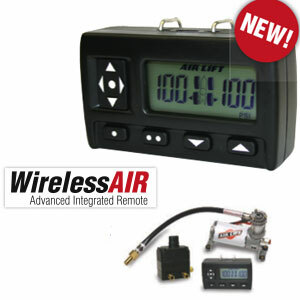 The Air Lift WirelessONE controller and compressor system is an inexpensive wireless compressor system for easy height adjustments on the fly. Simple to use and easy to install, the WirelessONE air controller allows you to adjust your ride height as needed using the wireless controller. 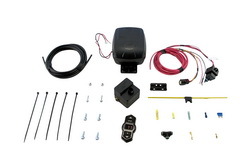 The WirelessONE air controller system is ideal for most recreational towing. 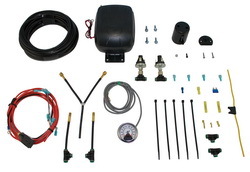 This system includes a standard-duty compressor that is perfect for vehicles used for occasional towing and adjusts both sides of the vehicle at one time. Air Lift LoadController Single allows for the simultaneous, equal inflation of both bags at the same time. A single gauge with controller is wired directly into the air compressor system to adjust air bag pressure and ride height and ride height easily and quickly. The Air Lift LoadController gauge can be mounted in an A-pillar gauge pod, flush mounted on the dash or with a suction cup mount, depending on your personal preferences. The Air Lift LoadController Single is available with either a standard-duty compressor (part number: 25850) for recreational use or a heavy duty compressor (part number: 25854) for commercial use. Air Lift Load Controller Double. 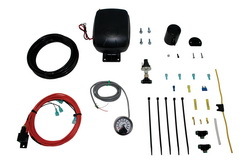 Air Lift Load Controller Double allows for the individual or simultaneous inflation of the air springs. A double gauge with controller is wired directly into the air compressor system to adjust air bag pressure and ride height and ride height easily and quickly. The LoadController Double is ideal for vehicles that carry uneven weights such as tool boxes or a camper. The Air Lift Load Controller Double is available with either a standard-duty compressor (part number: 25852) for recreational use or a heavy duty compressor (part number: 25856) for commercial use.